Ronnie Arbetter's preferred hot dog was a mustard kraut: a line of mustard and sour cabbage. He grew up in the family business, Arbetter's Hot Dogs, founded in 1960, working there after school and taking it over after his father's death in 2002. Ronnie Arbetter, 52, died Thursday of pancreatic cancer. ''Everybody that walked in through the door was a friend to him,'' said restaurant manager Jose Gadea. Arbetter attended Southwest Senior High School, where he played on the basketball team. ''He put the lightning-fast speed he'd picked up working in the restaurant's kitchen to work on the basketball court,'' said his best friend Doug Kirk. 'When they used to scrimmage, the boys would say, `I'm not covering Arbetter,' '' Kirk recalled. After graduation, Arbetter stayed with the family business, located at 87th Avenue and Bird Road in Westchester. The young man would open the shop before the crack of dawn, preparing tables, meat and bread for the day ahead. He learned how to recognize when the hot dogs were just soft and fat enough and how steamed the buns could be without getting soggy. In 1987, Ronnie and his brother Dave joined forces and opened Flaminia's Italian Restaurant -- named after their mother -- in Cocoa Beach. The also expanded the hot dog empire to restaurants in Cocoa, North Miami and Hialeah. The last two have since closed. Under Ronnie Arbetter's watch, kitchens had no timers, employees used common sense and ''feel-good'' logic -- and customers felt welcome. The restaurant became a pre-game hangout spot where athletes from nearby high schools -- Columbus, Southwest and Coral Park -- would meet. It was also the site of South Florida's largest World Series party in 2004. When the original restaurant opened in 1960, Robert Arbetter -- Ronnie and Dave's father -- had promised free baked beans when his favorite team, the Boston Red Sox, won the World Series. Robert Arbetter didn't live to see the day, but on Oct. 28, 2004, his sons delivered on his promise, giving out free services of baked beans, tinged with the flavor of salt, onion and molasses. Ronnie was himself a sports fan, often attending University of Miami and Miami Dolphins football games with Kirk. It was two years ago that a persistent stomach ache kept Ronnie from frequenting his favorite games. In May 2007, Arbetter was diagnosed with pancreatic cancer, but at first he would not let that deter him from working or hot dog-hunting. Even after receiving chemotherapy near Mercy Hospital every other Tuesday morning for months, the Arbetter brothers would have two hot dogs each at A.C.'s Icees on their way out of Coconut Grove. At other times, the team would go hot dog hunting across town, eating at Los Perros, Dogma Grill, Skyline Chili and Franktitude. ''Anytime we saw hot dog stands, we'd go,'' Dave recalled. Ronnie Arbetter continued to manage the Westchester restaurant until late last year, when his once-heavily-built body grew too weak to keep working. In addition to his brother, Arbetter is survived by sister Jill Arbetter. Arbetter's Hot Dogs, which is open 365 days a year, will be closed Sunday in Arbetter's memory. A memorial celebration will be held 1 to 4 p.m. Sunday at Hooligan's Pub and Oyster Bar, 9555 S. Dixie Hwy. Local Legend and Unforgettable Friend Ronnie Arbetter - Owner of Arbetter's Hot Dogs died on February 28,2008 of Pancreatic Cancer. A Miami native, he graduated from Southwest High School in 1973. He also received a degree from Barry University. He was a star basketball player for Southwest and was named Honorable Mention All City his senior year. He carried on a tradition at Arbetter's, a local landmark since 1960, of treating everyone who worked their like family. He was a great brother, and an incredible friend. He was deeply loved by so many people and he will be missed forever. In addition, Ronnie was a truly kindhearted person who had no enemies, only friends. He is survived and loved by his brother Dave Arbetter, Dave's wife Patty Arbetter and their children David Arbetter and Austin Arbetter. He also had a loving sister, Jill Arbetter and her two children, Andrew Lister and Casey Lister. There will be a memorial celebration of Ronnie's life on Sunday March 2 at Hooligan's at 9555 South Dixie Hwy., S. Miami from 1:00 p.m. to 4:00 p.m. To visit this Guest Book Online, go to www.MiamiHerald.com/obituaries. Published in The Miami Herald on 3/2/2008. My father-in-law who is now deceased, Richard Trond, had a lease and ran the Arbetter's store on Bird Road from about 1977-78 until about the early 90's when the lease was up. Both of his daughter's, My wife Dorine and her sister Debbie worked there in the 70's until they went off to college. I only got to eat there from 1987 to the early 90s when I last lived in Fort Lauderdale. A great place. 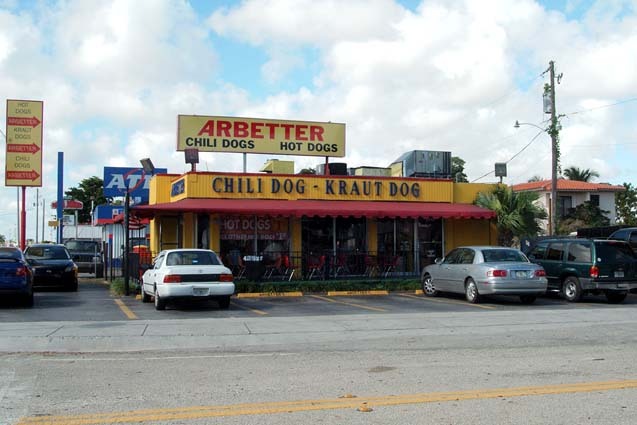 I started eating Arbetter's hot dogs when Bob was located next to Dairy Queen on Tamiami Trail close to Red Road. I loved those things....I would order 5 or 6 chili dogs at a time. I ate there at least 2-3 days a week. After spending a few years in the Air Force, I returned to Miami and the first place that I went to eat was....you guessed it....Arbetter's! We eventually moved from Miami and I missed those chili dogs tremendously! After finding this site and reading about the Cocoa location, I'm definitely taking a road trip to give it a try's! Still great hotdogs in Miami on Bird Road My wife and I eat at the Arbetters in Cocoa, FL It has Larry Bird posters and Red Sox signs also. Guest from 30-JUN-2015, thank you for your comments and your memories about Mr. Arbetter and his sense of humor. Arbetter's is still a great place to go, thankfully, and one of the few places in Miami that is still almost the same as it was a long time ago. I get very emotional when i write these letters. I grew up in Miami with the Arbetters restaurants and attended Rockway Jr. high and Coral Park Sr.High (graduated 1973) and remember after a long day at the beach surfing......picture a Dodge van, a Plymouth Roadrunner and a 67 Mustang and all of us would pour of these cool cars and ready to eat dogs! Laughing picking up change that fell out of our pockets on to the floor that we dropped as we looked for money to buy dogs! You know we walked in with the "Munchies" man what else!! Ronnie would look at us with those thick glasses and just shake his head and smile!! I was attending even George T. Baker Aircraft school and run all the way there to eat at lunch (2-CO'S -FRY- large COKE) I even would take girlfriends there and have a bite before going to Big Daddys or the Grove that night! Oh the people I miss and If I only knew then what I know now!!! If i could just look in there eyes one more time!!!! Yes, the Chili-dog I used to enjoy in the North Miami Arbetter's was Second to none. Ronnie did for the hot-dog what Ollie did for the original Ollie-burger: made it a wonderful and often still-remembered experience decades later. RIP, Ronnie. Although I never knew any of the Arbetters and never ate at their restaurants, the name Arbetter is neatly woven into my memories of my days at Miami High (Class of 49). After every Miami High football game (another win), all my friends would go to Valenti's on N.W. 7th Ave.) for pizza. The head waiter was Lou Paoletti and one of the waitresses was his sister, Phyllis (later married Bob Arbetter). I stayed friendly with Lou after he left Valenti's and opened a restaurant in Biscayne Blvd. in North Miami and later when he opened Paoletti's Restaurant in Coral Gables. He used to talk about his sister and brother-in-law (the Arbetters) every time I saw him until his untimely death. One of these days I hope to drop in at Arbetter's on Bird Road for nostalgic reasons if not to taste their hot dogs. My Friend buddy and I used to skip class at MDCC in 1978 and head straight for Arbetter's. It saddens me to see this great guy like Ronnie Arbetter pass from pancreatic cancer (a disease that took both my grand-father and my Dad). 2CO,fry,coke, was my favorite lunch order and this Miami institution will live forever. My first job was Arbetter's in No Miami, I was 15 and now I'm 45 years old. The best experience of my life. I worked there with my mom, Hellen Bianchi. The chilli hand made had a secret Arbetter ingredient, it came in a plastic bag. Know one knew what it was. The chilli dogs were so good that Barry Gibb actualy came in to eat them after a recording at Criteria Studios in North Miami. In Memory of Ronnie Arbetter:: I graduated SW High with Ronnie in 1973. We were like brothers, the best of friends. I was raised on those tasty steamed dogs that Mr. Arbetter (senior) had perfected. The best Chili Dogs in Miami !!! It was great to eat there everyday and enjoy Mr. Arbetter's sense of humor and loving personality. He was the ultimate Boston/ New England sports fan. None fiercer or more dedicated than him. Mr. Arbetter and Ronnies mom Phyllis, were like second parents to friends like Norm Heindrich, David Marine, Doug Kirk, Arnold Abreu, Royce Green, and myself. The Arbetter Family and the restaurant are Miami landmark institutions and I honor them as such. The Velasco family in Rockledge,FL. send their greetings, love, and respect to Jill, David, and the rest of the Arbetter clan. Jeffrey, I'm Bob Sara, Mickie's husband. We live on SW 139 ave. We haven't heard from you since you moved. Contact us and let us know where you are and how you're doing. My email is bobsvol51@yahoo.com. Jeffrey and Vicky: thank you for a wonderful tribute to Ronnie and his family and for filling the rest of us in on many historical tidbits about them and their great business. Jeffrey Hill and I, Victoria Dacosta; wanted to commemorate the profound effect on us of this special date by making our best effort to write a letter of memoriam that recognizes and celebrates Ronnies lasting legacy. Feb 28th will always stand-out in our memories because it is the date of your passing. We would like to first begin by extending a most-sincere Thank you for being such a great friend and truth-be-known, a role-model to both of us. I must say that it was obvious to me that you were the best player on the court. And Jeffrey can attest to that. Jeff and I reminisce and laugh and even share a few tears at all the fond memories we carry of you, Mr. Arbetter. I would also like to say that I know that Jeffrey was your best friend growing up and its so beautiful and comforting to me to know that. You continue to live in both of our hearts, and for that reason: we find it difficult to find closure. Thats indicative of how much you meant to us. The reason was very simple, your father was very nervous because business at the family restaurant was booming. And Bob knew that he needed your help to succeed. This was because the Bird Road store was within quick, driving distance of the areas four, major, high-schools- Columbus, Southwest, Coral Park and Killian and several smaller ones as well. From this point Jeffrey in his own words will continue about Arbetter Hot dogs journey to Bird Road and Ronnies legacy in general. For me (Jeffrey) given the perfect-storm quality of the afore-mentioned facts, the success of the Arbetter store seemed to be almost inevitable. Bob Arbetter had had several locations for his hot dog restaurant prior to the Bird Road store. The first Arbetters was on Flagler Street and several years later, Bob moved his store to SW 8th street. your dads hot dogs are the best in the world. Forty-years later, I still feel that way. What happened, (I learned years later) was that Arbetters was next to a Dairy Queen, and that the man who owned the DQ, owned and rented Bob the space he occupied. Then after years of seeing Bobs store do better than his, he gave-in to his jealousy and believing that he could emulate Bobs success- kicked him out. Bob Arbetter got the last-laugh, because in his desperation, he came across a closed, restaurant property on Bird Road that had previously been an Arthur Treachers Fish-n-Chips. And this became the new home for Arbetters Hot Dogs. I remember going there (tagging along with Ronnie) when Bob had just signed the papers and was rummaging-through the freezer of what was now his store... I was standing by the front door (trying to be as inconspicuous as possible) and I recall Ronnie laughing as his father held-up a bag of frozen fish while yelling, I dont know Phyllis... maybe well just serve fish. I joined-in and laughed too, but I could tell (even at seventeen) that the Arbetter family was v-e-r-y worried. I know for instance, that she is responsible for the Arbetter Hot Dogs chili recipe. I can still hear Bob yell, Put more on, m-o-r-o-n! to illicit laughter from the patrons when Columbus or some other high-schools kids would start to fill our lot with cars during a typical lunch rush. I look back on that time as an unbelievable experience. The fact that Ronnie, Bob and Phyllis allowed me to be a part of Arbetters was a privilege and a truly, precious memory that will always brings tears of joy to my eyes. I had to talk-about the inception of Arbetters on Bird Road first, because it was such a h-u-g-e part of my life as a young man. Bob partnered with Phylliss brother Arthur Paoletti to open an Arbetters in Hialeah. Since I was that stores first employee, I came to know his uncle Arthur very well. Maybe three or four months after we opened in Hialeah, Bob and Ronnie left me and Arthur in Hialeah to go open a store on Northeast 6th Ave in North Miami. Fast-forwarding from 1978 to 1988-91, I can remember stopping at the North Miami store at least once a week over that several year period to visit with Ronnie. Often, what had originally been intended to be a fifteen minute visit; would somehow morph into a several hour B. S. session.
. Partly because they are such a good example of how thoughtful he was. Once again, thank you for being such a wonderful friend to us. Still remember so many years ago, when a few of us went to this place I had heard of so many times. As we walked into this deserted place, (yes, it happens) a man approached and said "do you have reservations?" This was Arbetter. Never had a bad meal. Never had a better dog, either. Boy do I remember this place!!! Beginning in the early 60's on SW 8th street I ate there more times than I can count. I can remember going there for a take out order for my family which consisted of a sack full chili dogs for a couple of bucks. Absolutely the very best ever!! I was a telephone repairman at the time and went there so often for lunch in the little green truck that Bob used to call me Mr. Telephone Company. Most people never knew that Bob actually served hamburgers at one time in this location. I can still see him tossing the burger patties across the little room onto the grill saying "I never miss". I doubt he did either. There were 3 or 4 stools in the tiny place and it was seldom that you could find an empty one so most of the time you had to sit outside under the awning that connected Arbetters with the Dairy Queen. I left Miami in 1993 but still visit several times a year and almost always have lunch at the new location. The food is still great but I miss Bob. He was a helluva guy! I will always love you and never forget you Mr.Arbetter, You were a spectacular person to us all, and you had lots of great friends whom loved you and do almost anything for you! (I should know this) I was one of them! I believe out of all the people you knew threw the years, behind close doors I was the one person you confide in the most. We shared lots of time together especially, the last year of your life. It was a very difficult and traumatic time for you, and I thank god, that I was there with you and for you along with your family. I never wanted to leave your side, the last month before you passed only GOD knows how much I suffered and how much sorrow and anguish I went threw and how much I misery i felt, I missed you tremendously And till this day, I find it hard living with out you. You were everything to me Mr.Arbetter, I looked up to you like a father, you were my best friend, my boss and you were a excellent man to me too, treated me like a real lady, and I admired how very well spoken you were... you always tried to teach me different things, and I always appreciated your wisdoms and your advice on everything, because you had a good moral judgment and always did the right thing, I even enjoyed when you lectured me and scolded me! Thought it was nice, that someone like you cared so much for me. Your memory will never die. In my eyes and in my heart the image i have of you will always remain vivid, you and I bonded so much the last 8 years and I have never felt that kind of love before. It feels like I knew you a lifetime. It makes me Sad because I think I will not ever love someone as much, as I loved you, Not only will I never find someone like you, but No one will ever match up to you, and there wont ever be a another Ronnie Arbetter ever again! Your definitely one of a kind! They also had an Arbetter's in North Miami on NE 6th. Ave, just north of 125th. St.
We in this area were all upset when it closed. When my son comes in from Ca., one of our destinations is always Arbette's on Bird Road. Arbetter's Is Wonderful, My Wife, and I Go There Often !!!! We Love Their Chili Dogs, Cheese Fries, Corn Dogs, And RootBeer. We Live in Hialeah, and Believe Arbetter's, is Well Worth The Trip. It's Been Great, For Years, Both At S. W. 8th Street, And 88th, and Bird. We Hope it Stays Open There, A Long Long Time More, and If So, We Will Keep on Driving There. ronnie we will miss you. the ORIGINAL arbetters was on flagler str. before moving to the 8 str. site adjacent to dairy queen. bob would flip the bun over his shoulder and if it hit the floor your dog was free. 25 cent hot dogs and 10 cent cokes. dinnere for the bag boy at food fair x the str. jerry the owner of the dq didnt renew bobs lease forcing the move to bird road. the best thing that ever happened to the arbetters. i was once customer of the month at the N,M. store. It's the best hot dog in town. I used to go to the original one on 8th street. I now live in SC and when I go to Florida have to have Arbetters and Frankies. Thanks for the great food. great times ...couldn't get enough . The guy that owned the place was named Bob Arbetter. I remember checking the name in the phone book at the time cause I didn't really believe his name and yep he was there. He used to have a sign up at his place on 8th street and 58 Ave across from Food Fair that said "10,000 flies can't be wrong" He was a big Boston fan, and any year they won the pennant or series he featured Boston Baked Beans on the menu for free. Gene, are you retired MFD ? I think here there was place on bird road called SONNY pizza they were the best squared pizzas- it was like Frankie's style pizza that is also on bird but Sonny was better. Didn't they move up to 8th street for awhile? I've been eating there on and off since I started at St. John Vianney and St. Brendan's, about 1974. I think some of the employees have been there just about as long. It's also a big hang out for Columbus and Coral Park High Schools. There are a few old photos and memorabilia on the walls. I think I read that the original was on 8th street. I also remember another one in North Miami. This is the last remaining one. The very old sign that says "Free refills if you say 'I love Larry Bird'" isn't a joke. Try it. Hey, Arbetters is still there and still has the BEST hotdogs! I used to eat here often when I worked down the street at a Kawasaki dealer. Ahh, The memories.